Beagles are a small breed of hound dog, originally bred for hunting. They are a gentle, energetic breed, requiring plenty of exercise. They have a lot of stamina and a distinct baying bark. They have a smooth, medium-length coat with average shedding tendencies. Like any breed, some beagles are more prone to excessive shedding than others, though all will go through phases of heightened shedding. Brush your dog regularly. 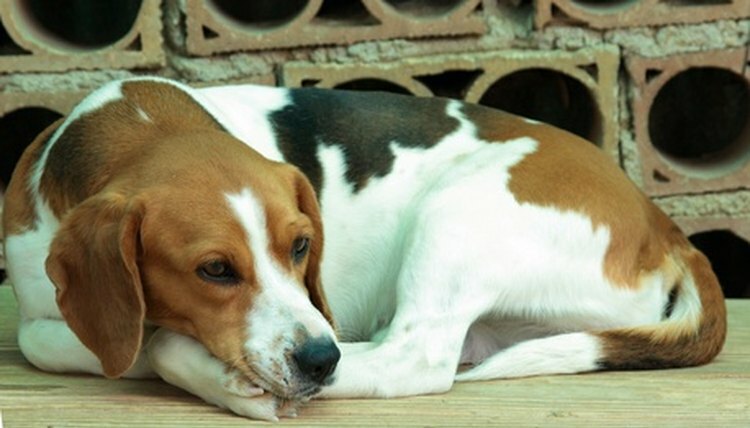 Beagles shed particularly frequently in the fall and spring, when their coats are changing for the next season. Brushing them helps loosen fur and get old fur out of the way for new fur growth. Using a high-quality rather than cheap brush may also benefit you because it will remove more fur and ultimately cause your beagle to shed less. Feed your beagle high-quality dog food. Poor nutrition can cause excessive shedding. Look for foods with all-natural ingredients or speak to your veterinarian about the specific nutritional needs of your beagle. She can recommend a brand or type of food for your beagle. Supplement your beagle's diet with omega-3 fatty acids. Other dietary benefits aside, omega-3 fatty acids are good for the health of your pet's coat. These supplements are easy to find at pet stores, often in the form of fish oil. Shampoo your dog every couple of weeks with mild soap. If your dog's coat or skin seems dry, switch to a moisturizing shampoo or give your beagle an oatmeal bath. You can either buy an oatmeal shampoo or grind up about a cup of plain, uncooked oatmeal and add it to your dog's bath water, then smooth the oatmeal-water mixture over the dog's coat and rinse. Take your dog to a veterinarian. Have her check your beagle for health problems because sometimes the cause of excessive shedding can be rooted much deeper. Your veterinarian may also be able to recommend a "shed stopping" supplement. If something's going on with your dog that you're unsure how to handle, it's always best to speak to your veterinarian. She'll know best whether it's normal or something to be checked. Catelyn Millette lives in northern Maine and has been freelance writing since 2010. She covers video games, crafts and animals, and studied animal science at Cornell University.